2 × = sixteen Required Please enter the correct value. Our financial experts – with a combined 250+ years in the markets – continue to give us solid investing guidance every week. And the recommendations they pair with their industry and market analysis are doing very well – as the chart below shows. Here are some of Money Morning's top outperforming picks when compared to the S&P 500 returns, based on actions highlighted by our gurus – plus our top returning short pick! Galapagos NV (Nasdaq: GLPG) is our big winner so far, gaining 578.8% since Money Morning Executive Editor Bill Patalon shared his recommendation with Money Morning readers in April 2012. The S&P 500 has gained 75.4% in the same time. Bill has renewed his recommendation for the Belgian biotech several times over the years, saying in 2016 that it has "an established history of piling on gains." With an average gain of 110% a year, it's hard to argue with that. Looking for Bill's latest pick to make big gains? Check it out here. 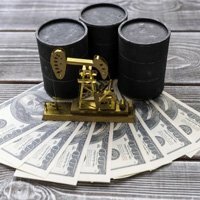 When Money Morning Global Energy Strategist Dr. Kent Moors talked about the profit potential of Cheniere Energy Inc. (AMEX: LNG) to our readers in November 2011, it had already risen 184% in just the previous month. But Kent didn't think it was done rising. He saw a "nice pop in share value" ahead as natural gas demand grew, and he was right. Cheniere has risen 367.5% since then, compared to an S&P rise of 97.3%. Cheniere remains a leader in the natural gas industry. There's more where that came from. Here Kent highlights two stocks that stand to gain from the rising tide of renewable energy. Activision Blizzard Inc. (Nasdaq: ATVI) had also been on a tear in October 2015, having climbed 84% in the previous two years when Money Morning Director of Technology & Venture Capital Research Michael Robinson highlighted it for our readers. In the less than two years since, the video game designer is up another 80.8%. Activision boasts such blockbuster franchises as Call of Duty, World of Warcraft, and Candy Crush Saga, making it one of the top companies in the video game industry. Michael continues to pick winners in the tech industry. Check out his two ways to profit from a new merger in the high-tech home services market. On the short side, J.C. Penney Co. Inc. (NYSE: JCP) is an example of what the "Retail Ice Age" is doing to stocks. Money Morning Chief Investment Strategist Keith Fitz-Gerald wrote in October 2016 that "Amazon has permanently altered the retail brick-and-mortar experience," and that it was only a matter of time for a retail dinosaur like J.C. Penney. This meant outrageous potential for investors willing to capitalize on it. Anyone who took his suggestion to short JCP at the time has profited from the 45.5% drop in share price. The outlook hasn't improved since then. As Keith reiterated in April, it's Amazon versus everybody else, and everybody else is losing. While retail is on the way down, tech is on the way up. In his latest investing analysis, Keith explains how to play "one of the biggest wealth-building opportunities you'll ever see." 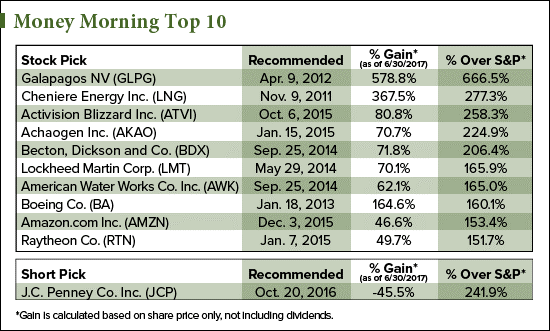 Looking for more stocks that are aiming to get on the top 10 list? Go here for our latest roundup of stocks to buy for six new picks! Follow Money Morning on Facebook, Twitter, and LinkedIn.